Rare award winning CIA documentary, On Company Business painfully restored from VHS. “Inside the CIA: On Company Business” PARTS I, II & III (1980) is a gripping and penetrating look inside the world’s most powerful secret institutionalized conspiracy organization. This rare, long suppressed, award-winning documentary series by the late Great American Allan Francovich is an absolute must for anyone studying the activities of the CIA 1950-1980. Ex-CIA Spies Phillip Agee and John Stockwell risk all to expose the CIA Frankenstein in full relief, its perfidy and anti-democratic, anti-union methodologies. Understand how elite New York-London financiers were able to successfully subvert the American System by using the CIA as one in a bag of fascist, bloody tools to transform the USA into a tyrannical Empire the Founding Fathers flatly rejected. Don’t expect any stands for human rights or one man one vote from these amoral operatives. See Richard Helms, William Colby, David Atlee Phillips, James Wilcott, Victor Marchetti, Joseph B. Smith, and other key players in a uniquely American tragedy of truly historic proportions. 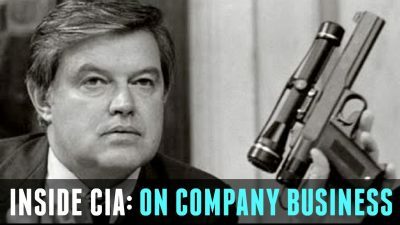 “Inside the CIA: On Company Business”, one of the most important American films ever made, is a vital and dramatic examination of the CIA and US foreign policy.